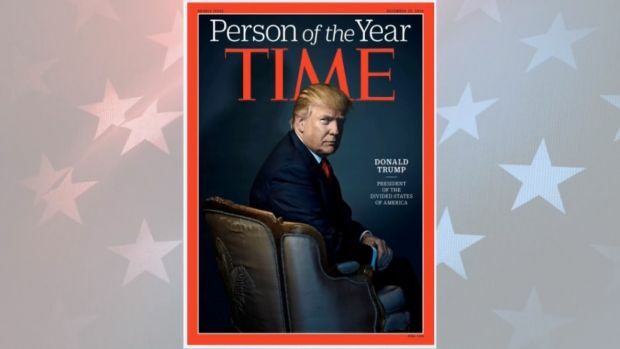 President Donald Trump is indeed on the shortlist for Time Magazine's Person of the Year, the "Today" show revealed, two weeks after he tweeted he was turning down the title. Trump, the reigning person of the year, said in the tweet that the magazine "called to say that I was PROBABLY going to be named" person of the year, if he agreed to an interview and photo shoot. "I said probably is no good and took a pass." Trump is joined by nine others on the 2017 shortlist, including some people he's feuded with: special prosecutor Robert Mueller, North Korean leader Kim Jong Un, Amazon founder Jeff Bezos and former San Francisco 49ers player Colin Kaepernick. The #MeToo movement also made the list. Each year, Time picks the person, group or concept that has most influenced the news and the world "for good or ill."
Time Magazine announced President-elect Donald Trump as its 2016 Person of the Year on Dec. 7, 2016, labeling the real estate mogul "President of the Divided States of America" on its cover.